Caitlin Richardson and her husband, John McCormack, use money from Airbnb to pay down the mortgage on their new house. Whether it's contortionists on the way to their next tour stop, or parents visiting a daughter in hospice care, at the end of the day visitors need a place to rest and recharge that doesn't break the bank. That's why many turn to hosts who post their guest room, their basement or their apartment on rental sites like VRBO and Airbnb. "We've had people come in for all sorts of things. 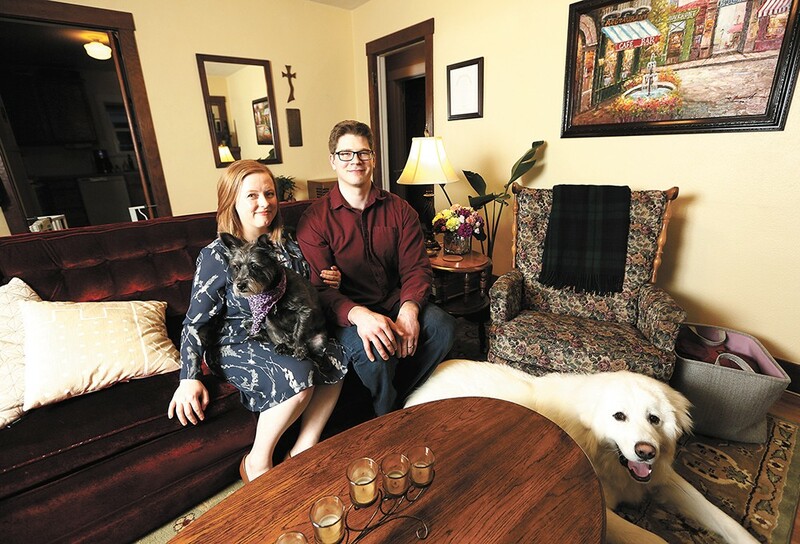 Weddings, baby showers, hospital stays," says Caitlin Richardson, who with her husband John McCormack has rented out a guest room in their Downriver neighborhood home for about a year now through Airbnb. "We see people dealing with great things and hard things, and we get to be with them on their journey." For Richardson, her first stay in an Airbnb early in 2016 convinced her it might be a good idea to look into hosting. She was in Seattle for her sister's wedding, and found a posting that was not only closer to her family, it also cost about half what hotels were charging farther away, and had its own kitchen, making for more affordable meals. Now as hosts, the Spokane couple is able to rent out their often otherwise unused guest room multiple nights a week. The site adjusts the price within a range the couple is comfortable with depending on demand. During busier times, such as Hoopfest, the price is closer to $50 a night, and during slower times such as the middle of winter, it's closer to $25 a night. "We thought we might meet some interesting people and make some extra cash," Richardson says. "We just bought our house two years ago, so any extra money helps pay down the mortgage." While short-term rentals have made it easier for people to earn money on the side, they've also run into legal gray areas as government agencies try to keep pace regulating the emerging industry, hotels denounce lax oversight of their new competitors, and listing sites push back against new rules. Airbnb has sued New York City and San Francisco, among other cities, over regulations that threaten fines over illegal listings. Oregonian reported in September that Portland had lost 1,000 affordable homes because they'd been converted to short-term rentals. For nearly two years, Spokane has required people who rent out their space for less than 30 days at a time to register with the city. Part of the thinking behind the new rule was to ensure that people are paying their taxes and to deal with complaints that the hotel-like rentals weren't allowed in some city zones. The city permit, required for rentals in residential areas, has an initial cost of $150, then $100 for every year after that. Twenty-one months into the program, only 18 locations have registered. That's a far cry from the actual number — a quick search on Airbnb showed anywhere from 20 to 120 places to stay on a given day of the week in Spokane. At least a dozen sites were available on VRBO. Richardson says that she and her husband were the third to register and make sure their listing is aboveboard with the city. That means keeping city and state business licenses up to date and paying taxes. "Airbnb has made it so simple for us to be hosts," Richardson says. "They, in Washington state, will collect and remit on our behalf our tax due to the Washington State Department of Revenue." They still need to deal with some added work on their taxes, but Richardson works in finance, and says the process didn't seem daunting to her. That said, she understands how it might give others pause. "I know my husband, when he first looked at it, it seemed like an insurmountable amount of paperwork," she says. "To me, it seemed like three forms and we're done." One Spokane woman who uses Airbnb, and asked not to be named as she isn't registered, says she plans to stop hosting soon, partly because a surplus of listings has created competitive pricing that makes it difficult to turn a profit. She was one of only a few places in the area on the site when she signed up, but now competes with so many others that between lowering prices to get more bookings and paying taxes, the amount of work it takes isn't going to pencil out. However, plenty of people like Richardson and McCormack find that renting their room pays off. "Airbnb helps Spokane residents turn one of their greatest expenses — their homes — into a way to make ends meet," Airbnb spokeswoman Laura Rillos says in an email. "The typical host in Spokane earns $5,500 per year, which is meaningful income that helps many pay their bills." Hosts keep 97 percent of what they charge, Rillos says, and guests tend to stay longer and spend more at local businesses when they stay with Airbnb, "so this can generate significant revenue for the local community." Richardson and her husband point people locally whenever they can. "One thing we particularly like to do is direct people to local businesses," she says. "Restaurants, shops, the museum, parks, so they can kind of fall in love with Spokane. We're not from Spokane originally. ... It took a few years before we found these great restaurants and places you need to know by word of mouth, and we try to offer that to give them a glimpse." Enforcement against those who aren't following city rules has been complaint-based, says Donna deBit, assistant planner for Spokane. "We're not really in the business of head-hunting, getting on Airbnb and writing up everyone who does have one listed," deBit says. However, it'd be a good idea for everyone to get on board, deBit says. Not only could they face fines from the city if they're found out, but if something were to go wrong, they might not be covered by some insurance policies due to not following local codes.